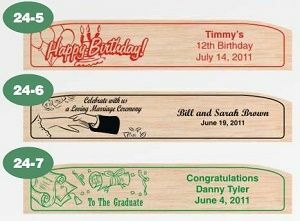 Our stock design balsa wood gliders with your custom message imprinted are sure to bring out the kid in everyone! A quick and easy way to create a glider for your special holiday or occasion. 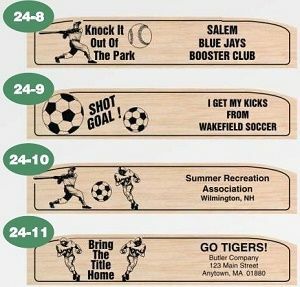 Pick out one of the several stock designs that will appear on the left side of the wing, supply us with your personalized message for the right side of the wing and we do the rest. Available stock designs include many holidays, special occasions and various sporting events. These custom printed wooden toy airplanes can be flown indoors or outdoors. 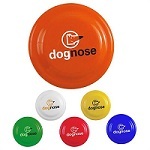 Imprinted airplanes with your company or campaign name are an excellent advertising value. Call 706-258-7041 for a FREE quote. Put our years of promotional and advertising experience to work for you! 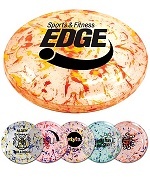 Available stock designs include many holidays, special occasions and various sporting events. Select from the 13 stock designs below. 8" Wing Span. Can be flown indoors or outdoors. A perfectly proportioned glider designed for maximum flyability. All parts smoothly machined – no die-cut parts. Imprint area: 1" x 3" text on right wing only. Straight line text only - sorry, no logos allowed on our stock gliders. 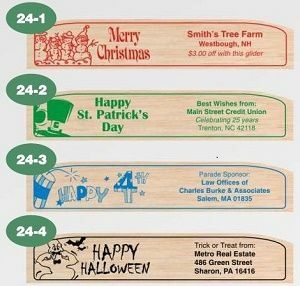 For other Standard Custom Imprint Color (Red PMS 200, Blue PMS 300 or Green PMS 334), add $20.00 per order. Copy prepared by us will be created with a typeface of our choosing, if a specific type is to be used it should be noted on the order. We will inform you if the typeface is not available. 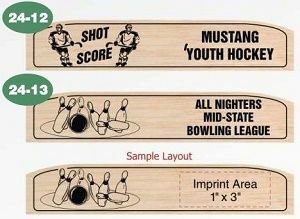 Inks tend to print darker on balsa wood. Exact color match is not guaranteed. Metallic inks can not be printed satisfactorily on balsa wood and are not recommended, factory will not be responsible for quality of imprint. Small reversed, screened, fine line copy or close multi-color registration can not be printed satisfactorily on balsa wood wings and are not recommended – factory will not be responsible for quality of personalized imprint if it is submitted. Wing Imprint Area: No copy allowed in center of wing area. All glider wings will have a printed thin border line around the outside perimeter as illustrated in the photos of products. This line is necessary for registration purposes. Templates for all our gliders are available. No bleed off wing is allowed. NOTE: Due to new Federal Regulations we are required to put Lot #'s on all products and packaging. 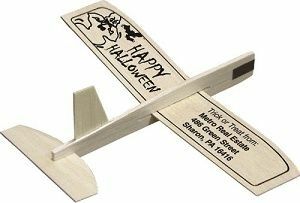 If you are looking for ALL copy to be custom printed on your Wooden Airplane, please see our Custom Printed Wooden Airplanes. For another promotional airplane option, see our Penny Paper Airplanes. Call or Text 706-258-7041 to put our promotional and advertising experience to work for you. FREE quote provided.